A preprinted HMIG-HMIS label is not only more professional – but is easier to read, more durable and, surprisingly, quite affordable. Avoid the headache of handwriting your labels. 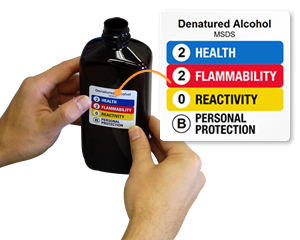 Preprinted Custom HMIG-HMIS labels are more legible than hand-written labels. • Just click on any of the templates below. You’ll be able to enter the chemical's name, ratings and, optionally, the Manufacturer, Date and CAS number. • Find a range of custom HMIG-HMIS label materials, including Vinyl, Laminated Vinyl and Paper. • Wizard shows you how to choose your rating and PPE codes. Preprint a sign with your exact ratings, PPE symbols and chemical name. Post signs near your chemical storage areas..